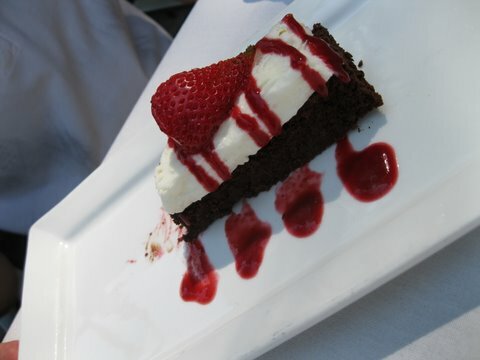 Summerlicious is a food festival that occurs in the wonderful city of Toronto during the hot and sticky month of July. Restaurants sign up to join the celebration and as a result, offer three course lunch and dinner menus at a fraction of their regular prices. For foodies like my friends and I, this was a great excuse to get in the brand new Rally Blue Subie – that’s a Subaru Impreza for non-petrosexuals 😉 – and cart our behinds down the 401. Well, that and the fact that some great bands were also playing live for which we had tickets. Our first Summerlicious experience was also Bon Jovi night at the Skydome (I refuse to call it the Rogers Centre because that says nothing of the fact that when Skydome was first built, it was the only stadium with a fully retractable roof – and is possibly still be the only one – as a result, I think the name Skydome is far more appropriate than plain ol’ Rogers Centre, ‘nuf said). Anyway, back to the original plot line. 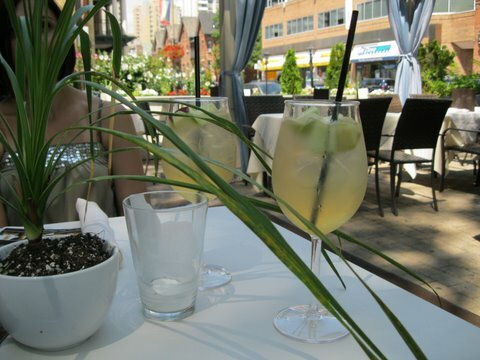 Day one of Summerlicious had us traipsing around downtown in the gay village. We were looking for a restaurant named Fuzion which served fusion cuisine; fairly self-explanatory. Along the way, we witnessed many wonderful things. Firstly, the way people dress in The Village. The styles vary so greatly that there isn’t really any particular style in the first place which I loved and found to be a real treat for the eyes. Compare that to Bay Street in Toronto where approximately 90% of people are wearing black suits and you get the idea. The other was the fact The Village had plenty of lovely parks and places where people could sit and chat, complete with cafes attached to large outdoor patios located in front of the various establishments, like one might see in Europe. Lastly, we could not help noticing the dog pairs. I am not making this up. It seemed that everyone (ok, not everyone, but thereabouts) had two of the same dog on those hilarious split leashes one only gets to witness in kitschy 50’s movies set in New York. In total, we saw three pairs of canines within the span of an hour. Two little white Poodles, two beige Pugs, and two black Cocker Spaniel-types walking side by side like optical illusions. Hilarious! And apparently, only in The Village. We arrived at Fuzion after some walking in the heat and were politely welcomed, then offered a table on the elaborate patio which was surrounded by trees and flowers and had pretty tables with *real* tablecloths on them! The waiter seated us and asked what we wanted to drink, while in the same breath, deftly suggesting white Sangria. We all looked at one another in delight and immediately affirmed our need for that delicious and perfect summery drink mix of wine, juice and fresh fruit; very refreshing yet still quite potent. Our Sangria arrived just as we got settled and it was oh-so-scrumptious. White wine combined with white cranberry juice topped with sliced apples and served in a glass filled with just enough ice. I tried not to down mine in 30 seconds but was unsuccessful. We announced that we were here for Summerlicious so the waiter brought out those specific menus and gave us time to decide what we wanted to order. 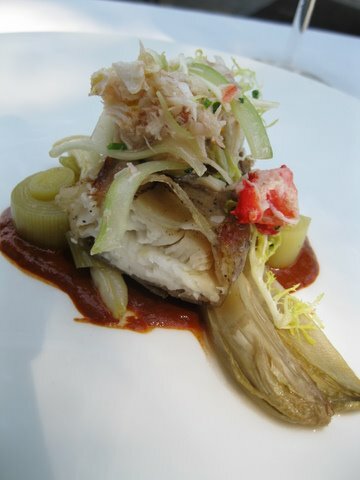 The beauty of Summerlicious is that even though the menus are limited, one still gets at least three choices per course. 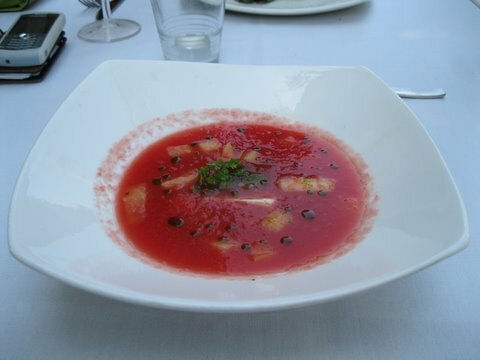 In this case, two of us chose the radicchio and pancetta salad to start and one of us chose the savoury watermelon soup. Who knew this could work? The salad was very bitter, which was unfortunate, and the dressing did nothing to conceal this as it was acidic. The watermelon soup, however, was a smash hit. It was not sweet at all but rather peppery and savoury. It was refreshing and lovely but very difficult to describe. 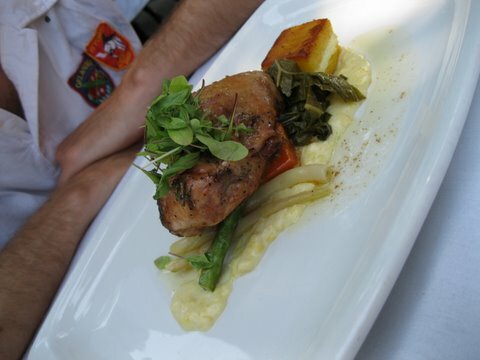 For the main, we each chose one of the three options: roasted quail, goat cheese gnocchi and a fish dish, respectively. The quail was beautifully cooked with a lovely lavender sauce surrounding it. This seemed strange when we read it on the menu but was such a delicate flavour and only hinted of lavender when eaten with the poultry. Lavender cakes and delicacies have been eaten for many, many years in Europe but this pretty purple flower utilized as an herb is a newer concept in North America, which is unfortunate. 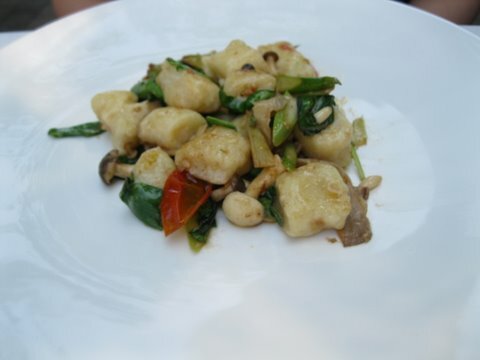 The gnocchi was soft and warm with a hint of goat cheese flavour which resulted in a very smooth, noodle-like consistency. It was surrounded by a mushroom and spinach sauce which complemented the Italian dumplings quite well. The fish, which was my choice, was (unfortunately) not very good. I felt it was dry and rather boring although the crispy potato cake which surrounded the fish was quite wonderful and reminiscent of French fries (fish and chips are a classic combination, after all). After sharing our meals with one another and exchanging comments, we completed our meals with dessert. Once again, we had three choices and each of us chose differently. The chocolate mousse cake was good (but not great) and the other two choices – both simple sponge-type cakes surrounded by fruit and whipped cream – were definitely subpar. 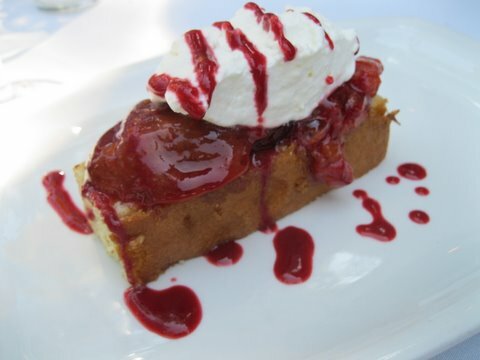 I didn’t even finish my serving and I adore dessert at the end of a savoury meal. In essence, our experience at Fusion was alright but not quite what we were expecting for an event like Summerlicious. We left satiated but somewhat disappointed, although the Sangria was top notch (but then again, anything with wine always is in our eyes!). Thankfully, the Bon Jovi concert was a whole lot of fun mixed with some great rock tunes and plenty of nostalgia. 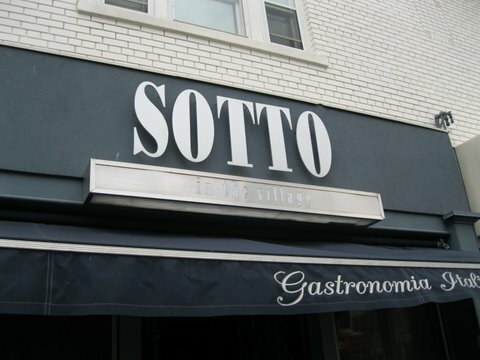 Our second Summerlicious experience was, ironically, out of The Village but at a restaurant called Sotto in the Village (no joke). This was an Italian eatery in a historic part of East Toronto. It was an unassuming place on the main street strip surrounded by quaint little shops and lots of very expensive automobiles. The restaurant was tiny but cozy and elegant with lots of old Italian posters and decorations. The music playing was a selection of classic Italian songs from the 1950’s – we felt like we had stepped back in time. Our waiter (the only one in the entire place) greeted us warmly and with his rather thick Italian accent explained the specials. 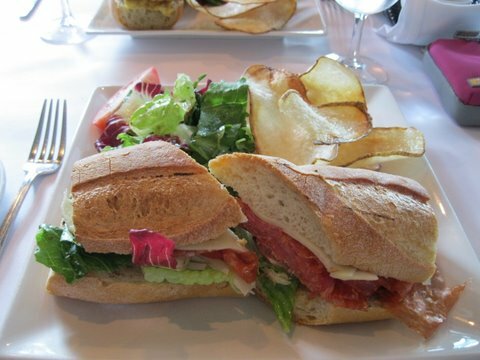 We peeked at the menu and both chose Panini sandwiches. These arrived rather quickly, but obviously freshly made. The Panini’s were served with side salads as well as the most ingenious way of cooking potatoes I had seen in a very long time. It was like they had crossed chips with French Fries – fresh potatoes sliced thin on a mandolin and then fried until hot and crispy. These were delicious and were served plain with no salt and no ketchup so we could really appreciate the taste of the potato itself. The side salads were also very fresh. Mine arrived with a light coating of vinaigrette (thankfully not from a bottle) while my dining companion asked for a Caesar salad instead. The waiter explained that this was something they don’t normally do but graciously accommodated her request. The Caesar was not particularly exciting but was still very fresh; we actually caught the waiter making it in the kitchen which was quite charming! The two Panini’s we chose were a daily frittata option (in my case it was a lovely combination of peppers and mushrooms) and the other was a Prosciutto option. The frittata was hot and light with just enough mushrooms and peppers. The prosciutto was surprisingly spicy but had just the right amount of heat, which was a nice surprise. We gobbled up the fry/chips and crunched down our salads. Our waiter was attentive and charming which added to the Italian flair of the restaurant; belissimo! Overall, we had some really great yet simple food (which can be so difficult to find) and agreed that we would be back. Once we had completed our meals, it was time to head to the Molson Amphitheatre to see the Kings of Leon boys from Tennessee rock the night sky, which they did with aplomb along with multiple comments about whisky. A great night was had by all. Rock on!